Discover Japan and its eccentric and bizarre culture... What is NORMAL? This isn't a Pokemon Gym for Flying Types, But it does Shock! Pokémon jets Have you ever seen such an airplane? It’s Pokémon jet! As you know, Japan has rich animation culture. The jet features Pikachu and many other popular Pokémon characters. In Japan they spell it as Pikatyuu. The inside of the planes have seat covers and curtains as well as on the surface of the jet. And also the staffs in the costumes of Pokémon serve drink cups designed Pokémon. By the way, why do they have these awesome jets? To advertise Pokémon? Or to show off Japanese culture? It's both! 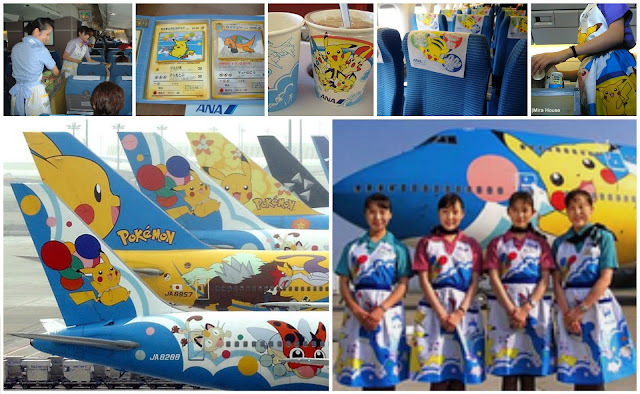 The livery is intended to embrace and exploit the anime culture, specifically Pokémon. ANA Airways target families through their children. It has become difficult to get tickets of Pokémon jet because of popularity. The children who luckily get a chance to take Pokémon jet are given limited item as a present. SO! WHAT DO YOU THINK? ARE YOU EAGER TO FLY? Nice blog Cihan . I never knew that a Pokemon 747 livery ever existed. It's quite rare to see such aircraft livery paint schemes here in Australia. ANA Airways sure does impress when it comes to service and brand promotion! Hey curious bloggers! We'd love to welcome you all to discover the awesome, funny, interesting, and flat out bizarre aspects of the Japanese Culture! Follow us in stumbling upon the marvels of the modern day Japanese world! Who are we? Well first off, my name's Cihan, (LIKE Jihan - but only spelled with a C) I'm a local Aussie who has a curious mind for the Japanese culture! Luckily I also have my fellow Blogger Kohei... and you know what makes Kohei a fantastic bloggmate? He is Japanese! (he's our insider). And there's Ly... the resident Vietnamese undergraduate student (like the rest of us) but only she can laugh you to death faster than a Samurai can draw his Katana sword! Baseball in Japan - Swing and Miss? Maybe not! Casual Yukata or Luxurious Kimono? Onsen - Taking a Dip! Bowing Etiquette – Are you doing it right?